A few years ago I wrote a piece about long term local Gracetown resident, Arthur Armstrong and the good news is that he is about to achieve the milestone of reaching 90 years of age. Of course, Arthur will tell you this is because he has worked hard all his life and it would be extremely difficult to argue the case against him, although some family genetics may also be involved here. 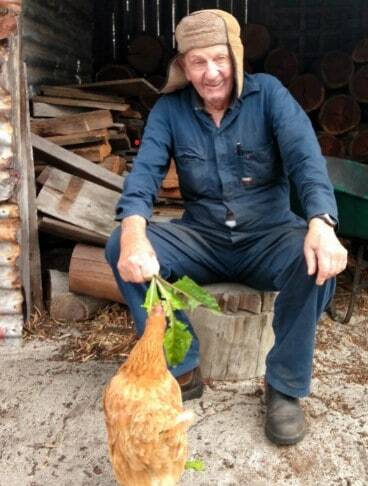 Nearly every day Arthur pulls up in our driveway, announcing himself with a loud beep of the horn and calling out to our last remaining chook, affectionately known as Debbie, which is basically a pet now, since she has stopped laying. Debbie is free range with a capital F, as we have never been harassed by foxes, so just leave the pen door open for her to come and go as she pleases. Upon Arthur’s arrival she waddles out from under the house to greet him, knowing she is about to be treated by a fresh serve of thistle or silverbeet. When someone calls around to the house and Arthur visits, seems they all know him from days gone by and at some time or other have provided him with a feed or two. You see, Arthur is REALLY from the old school and back in the day if he didn’t send you a bill for some plumbing or blasting work, then at least you gave him a decent feed for the next day or so. There are a few Gracetown families that visit him and do this regularly, like Lyn and John Jacko and I know for sure that many of the Cowtown long termers do likewise. On these regular visits, if ever you want a heart felt discussion on topics such as politics, the youth of today, land management, growing vegies or even the weather, then you best put those jobs on the backburner, cause you’ve opened up a can of worms, be prepared to lose half a day, but you can bet you will learn something. The rear of Arthur’s van is full of chain saws and such are his handyman skills, there is basically nothing he can’t fix, especially given his backyard has pieces of almost every machine ever made. I am now the proud owner of two of Arthur’s old Deutscher lawn mowers, which I am sure in time will become relics on the block. Anyway, I have become severely distracted from my primary reason for writing this article and perhaps that is the affect Arthur can have on all of us. So, for anyone that has had a connection with Arthur over the years and would like to catch up for a yarn or two, you are most welcome to come along to a small celebration being held, with all the details below. Promise there will be no fireworks! See you there. ARTY’S PARTY- THURSDAY MARCH 28, 430PM ONWARDS, BRING PLACE TO SHARE AND OWN DRINKS, MELALEUCAS BEACH ( DOG BEACH AT SOUTHERN END OF COWARAMUP BAY ).